Whether you garden in traditional tilled garden beds, raised planting beds, or in containers, soil is the most important part of your garden. 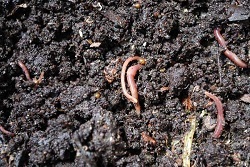 Good, healthy, organic soil is the key to robust plant growth and bountiful production. We carry everything you need to create an ideal growing environment for your organic garden, both in our retail store as well as our online store. » Organic Soils and Planting Mixes - We maintain a large stock of potting and garden planting mixes for all organic growing. Our potting soil is our top selling product, and is ideal for creating raised garden beds and container gardening. For even more control of soil nutrients, choose one of our specialty potting soils for specific uses. You will find a complete stock of potting soils in our retail store and our online store. » Build Your Own Soil - We have a wide selection of organic soil additives and amendments to help you create an ideal soil mixture of your own or to correct soil deficiencies in your garden beds. From our Premium Organic Soil Amendments to Vermiculite and Perlite to loosen heavy soils, you will find the exact products you need for your particular situation at our retail store and online store. » Test Your Soil - We carry a complete line of soil testing products to help you manage your soils chemistry and provide the very best environment for your organic gardening. Our easy to use kits allow you to test the pH, nitrogen, phosphorus, and potassium content in your soil. We offer the tools you need to keep your garden at its peak performance. » Composting Tools and Supplies - Composting is the organic gardeners way to return powerful organic nutrients to garden soil through recycling of organic waste materials from the kitchen and garden. We offer the most advanced composting systems and also stock compost activators and everything else you need to create great compost for your garden. » Specialty Soil Products - One size doesn't fit all when it comes to organic soil, that's why we offer a wide range of special soil products to suit special needs. From special planting mixtures of commercial-grade blend of fir bark, Canadian Sphagnum peat moss, perlite, pumice and lime for orchid growers, to additives and amendments to suit specific situations. We have all your organic gardening needs covered, both at our retail store and our online store.